Every year, the city’s fate is supposedly sealed by the drawing of a Chinese fortune stick by an official representative of the Hong Kong government. This year, it was fortune stick number 27 that was shaken out of the bamboo holder and immediately the media, not to mention Fung Shui masters, started to cherry pick incidents (i.e. an interesting psychological phenomenon known as confirmation bias) that support the fortune stick’s non-specific predictions. For example, the South China Morning Post article (referenced below) drew readers’ attention to a fireworks barge catching fire and a pleasure boat springing a leak. Oh dear, just what are the chances of such incidents happening? And is this the only time such incidents have occurred? Furthermore, the article attempted to highlight bad incidents that occurred the last time fortune stick number 27 was drawn, back in 1992, which somehow supposedly confirms the view that Hong Kong’s fate in 2009 is sealed. Other Hong Kong newspapers and TV programmes reported similar story themes. Fung Shui masters are a lost cause (since they have a vested interest in finding confirming evidence, plus they don’t want to lose face even when contrary evidence stacks up against them), but it would help if journalists exhibited some critical thinking skills, and hence some critical reporting. As if recession and the prospect of a worsening economic downturn were not enough, Hong Kong yesterday drew the worst possible fortune stick in a ceremony at a Sha Tin temple. Lau Wong-fat, chairman of rural affairs body the Heung Yee Kuk, drew the stick numbered 27 on the city's behalf in the Taoist ceremony at the Che Kung temple. A fortune-teller at the temple who read the stick said it showed the city could not isolate itself from the global economic turbulence, but that Hongkongers should nevertheless be cautiously optimistic. Fung shui masters interpreted the stick's meaning differently. James Lee Shing-chak said it signified possible conflicts between the government and its people. Mr Lau said: "It is a warning to all of us that only a harmonious society with people staying united can enable us to get through our challenges." The last time that stick was drawn, 1992, saw, among other things, the arrival of last governor Chris Patten - who unleashed fierce political strife. When a Sha Tin district councillor drew the ill-omened stick 17 years ago, the council immediately burned it and drew another, lucky one. Yesterday, that option was not open to Mr Lau and, rather than the stick burning, it was a barge used for the Lunar New Year fireworks display that went up in flames last night. The barge, one of three from which fireworks were launched during the 23-minute display, burst into flames near the end of the HK$5 million spectacle that lit up Victoria Harbour. The barge's two crewmen were rescued. No one was hurt. Within minutes thick black smoke had engulfed the bow of the vessel. Fire boats soon doused the flames. Teddy Ng, watching with his 19-year-old daughter, said flames engulfed at least a quarter of the barge. Wilson Mao Wai-shing, chief executive officer of Pyro Magic Productions, which produced the show, could not be reached for comment. A spokesman for the Leisure and Cultural Services Department said it appeared sparks falling onto the barge had started the fire. It wasn't the only mishap on the harbour. Earlier, a pleasure boat taking 41 people to see the fireworks sprang a leak soon after leaving the Kowloon City ferry pier. A lucky 23,888 fireworks formed the display, which was watched by 250,000 people lining both sides of Victoria Harbour and featured the character for ox. The crowd was much smaller than expected. A turnout similar to last year's 400,000 had been forecast. Spectators gasped when curtains of gold and red fireworks cascaded or comets and sparking fireflies seemed to hover on the horizon. As well as the character for ox - which was hard to pick out - the show also featured for the first time the characters for "good luck" and the lucky numbers six, eight and 10. Afterwards spectators were divided about the merits of the show. Some said it was small and that, because it was a windless night, smoke had blanketed the harbour by halfway through the show. An amateur photographer, C. P. Chan, said: "I took pictures and the smoke started to get in the way after just 10 photos." But another spectator, Lois Wong Yu-siu, 19, said: "The combination of the music and fireworks matched." 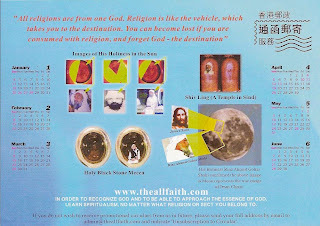 Recently, I received the following flyer in my Hong Kong mailbox. As with all beliefs, traditions and religions, the content contains unsubstantiated claims. 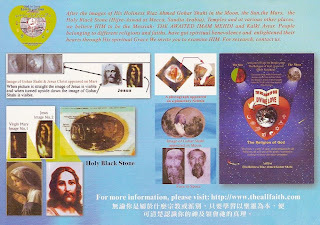 For example, this “authority” claims to be the “Messiah” based, as far as the content shows, on his apparent image appearing on photographs of the moon and other objects. These unsubstantiated claims can easily be dismissed with an understanding of the interesting psychological phenomenon known as pareidolia. I wonder what the real intent is in sending out this flyer in Hong Kong? Why would His followers want to target Hong Kong people who have never heard of this guy from the Indian subcontinent? Why would anyone anywhere want to believe in something that is based on unsubstantiated claims? If you're sensible and rational, you won't believe in this trash. The Year of the Cow (or Ox) began on Monday 26 January 2009. I’ve often wondered why the 12 animals in the Chinese zodiac are such an odd assortment of creatures. There are the farm animals cow (or ox), sheep (ram, goat), chicken (rooster), pig and horse. There’s also the mouse (rat) and dog. Then there are the wild animals rabbit (hare), snake, monkey and tiger. Plus the Chinese dragon isn’t an animal at all, just a mythological creation. It is perhaps telling that there are no aquatic or marine animals, nor are there any animal species specific to countries outside China. Given that the Chinese zodiac is man-made and derived from ancient times, it is unsurprising that the Chinese came up with this limited assortment of animals that apparently share certain traits with humans. Anyway the Chinese zodiac, like astrology, is hogwash. MANDY: So, you're astrologers, are you? Well, what is he then? MANDY: What star sign [Chinese zodiac] is he? WISE MAN #2: Uh, Capricorn [Chicken]. MANDY: Uhh, Capricorn [Chicken], eh? What are they like? WISE MAN #2: Ooh, but... he is the son of God, our Messiah. MANDY: And that's Capricorn [Chicken], is it? WISE MAN #2: Uh, no, no, no. That's just him. 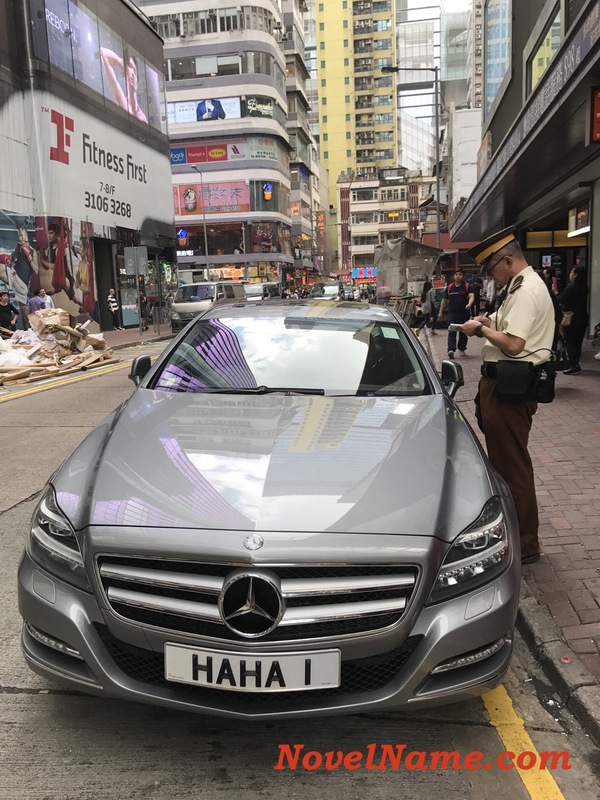 Hong Kong Chinese have a high proportion of novel English first names that are, to say the least, creative and even daring. For example, my preliminary analysis reveals 2.5% of Hong Kong solicitors (i.e. 143 out of 5,707) have novel names. The percentage is likely to be higher now Novel here is defined as uncommon, unusual or unique. Over the years, I have collected a fair number of novel names (which is why this blog will feature a regular "Novel Name of the Day" post). Possessing a novel name is a phenomenon that is observed most frequently amongst Hong Kong Chinese, whereas it is relatively less common to spot a novel name amongst mainland Chinese, Singapore Chinese and Taiwanese. 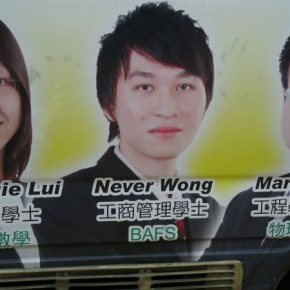 What is it about the psyche of Hong Kong Chinese that compels them to create and retain odd-sounding novel names? From my understanding, when a population or society is unaware (or ignorant) of name rules or memes then, depending on how the relevant society regards the values of "creativity" and "conformity", there will be individuals who will adopt rare, uncommon names (e.g. Adolf) and perhaps even create their own novel names (e.g. Alnwick). Dare I ask whether expressions of creativity and free thought are relatively more common in Hong Kong? There are other possible reasons (e.g. mainland Chinese are latecomers in adopting English first names, Singaporeans have a relatively better grasp of traditional English, etc), and I'd be interested to hear people's thoughts on this (e.g. Elmer'sLifeinHK). In the meantime, I hope this blog's "Novel Name of the Day" feature will bring some enjoyment and perhaps curiosity to readers. What Are the Weird English Names of Chinese People?